5793 labyrinths found. Showing 3121-3140. Sorted by country, state, city, then zip/postal code. Rt. 4 (Pennsylvania Ave. towards Upper Marlboro) to Prince Frederick. Rt. 4 becomes Rt. 2/4. Right on Rt. 231 (light past Wal-Mart) approx. 2 miles; left Jct. 508 (Adeline Rd.) approx. 1 mile; left on Jct. 506 (Sixes Rd.) 3/10 mile on left side look for either Red Barns -Use this Driveway immediately after or one in front of the Red Tobacco Barn ... red mailbox has American Flag flying from tree behind it. park behind Lyle Simmons house or in front of large red barn & walk to labyrinth. Rt. 2 until it becomes Rt. 2/4 and then follow directions from Washington. Rt. 695 to Rt. 97 to Rt.3/301. Follow signs to Bowie-Upper Marlboro. Get on Rt. 2 South and then follow directions from Washington. Rt. 2/4 North, left on Rt. 506(Sixes Rd.) 3-1/2 miles on right side. Look for the tobacco barn or red flower Barn. Rt. 5 to Rt. 231 over Benedict Bridge, approx. 1 mile right on left Jct. 506 (Sixes Rd.) approx. 2-1/2 miles on right. (make sure you cross over stop sign on rt.508/Adeline rd. staying on Sixes Rd.) farm on left. Cretan style, designed and constructed by owners. Hannah More School is located 7 miles north of the Baltimore Beltway, Route 695. 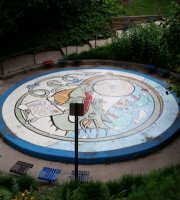 The labyrinth is located behind the school's back parking lot. In the little town of Glyndon, 20 mi. NW of Baltimore. Always open day and night on private property in the forest. Night lighting and seating. Saturday May 3, 2014 from 1pm to 3pm. LFLC is located at the intersection of Veirs Mill Road and Broadwood Drive. 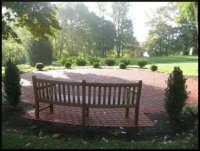 This image was taken on the day we rededicated the Mary Carter Barrow Memorial Garden. 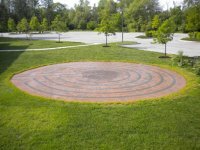 The labyrinth is located with the Mary Carter Barrow Memorial Garden courtyard, which is available for prayer, reflection, and special events. The Garden entrance is located across from the side parking lot (where staff parking is) and accessible by a straight sidewalk. Look for the two columns flanking the entrance. 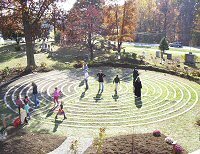 While our labyrinth is available 24 hours a day (we have ambient lighting), please be advised that our worship services are on Sunday mornings and that the Garden where our labyrinth is located might be in use at other times for special events. You are welcome to call ahead. Or stop by and please be respectful of others using the Garden space. 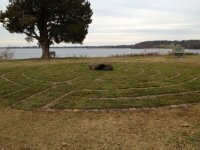 The labyrinth is in one area of the Garden, which also includes seating, a cross, and a fountain. Chartres a la Chelsea, 5-circuit labyrinth in buff and charcoal gray unit pavers. Three lights south of Route 50 and three blocks east of Route 13 and Peninsula Regional Hospital Center. 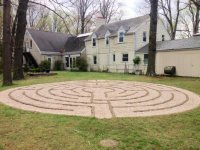 Labyrinth is in garden behind large white church. The entrance to the church is between Mt. Hermon Road and Glen Avenue. 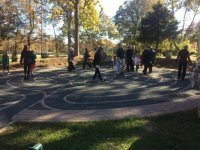 Located to the left of the parking lot, the labyrinth is open at all times and is accessible to wheelchairs and strollers. It is in a temporary location until we can make it more permanent. Note: Some GPS systems use Lexington Park, Maryland instead of St. Mary's City, Maryland. 38.1872 N° Lat. ; 76.4343 W° Long. As you drive onto campus, follow the road to the right. Take your first right, after the stop sign, into the public parking lots and park as far to the right as you can. 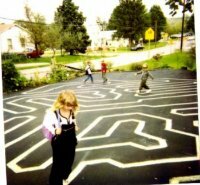 There is a path to the Labyrinth from the parking lot. 38.9329° Lat. ; -76.3348 ° Long. You are welcome to use our labyrinth at any time. We hope you will find peace, comfort, and strength here. This labyrinth is located outside the library off of the main road. Surrounded by a dragon and seeding you wouldn't notice it unless you were looking for it. Situated just north of Baltimore Beltway 695, exit 28, Providence Road. Open every day in the church grounds. 200 yards walk from Providence Road where there is a parking lot. This labyrinth is nontraditional: it was charted on a hexagonal grid. It is not round, nor is it divided into quadrants, it has no center; the line is continual and returns to its starting point without retracing your steps. There are three vaguely heart shaped areas in which to pause. If the walk is begun in one direction, these inner heart areas of shorter line segments (with frequent turns) are encountered early in the journey, and then the path leads outward. If the walk is begun in the other direction, one is led from the periphery into the central areas. 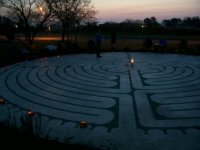 The labyrinth, its embedded images of upturned hands, and each walk of the labyrinth are inkblots: they serve as metaphors for each individual according to where they are in their life's journey.